The Huawei Mate 10 comes packed in a flat cardboard box. Inside you'll find a 22W charger, a USB Type-C cable, a pair of earphones and a soft silicone case. 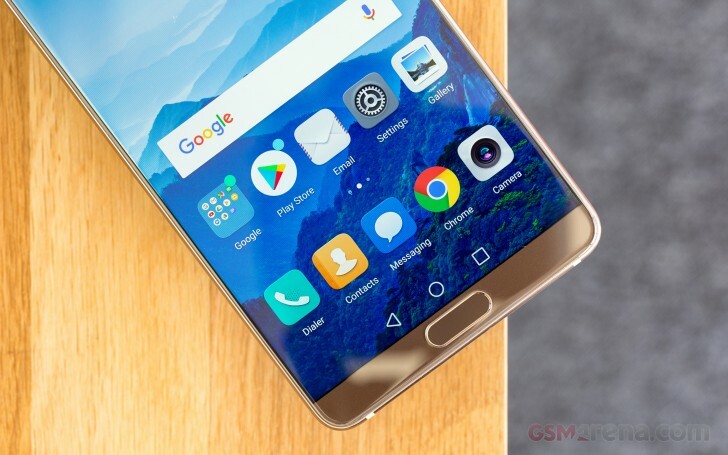 The USB cable has the extra pins for Huawei's Super Charge technology, so if you want to quickly top up your phone the bundled cable is a must. If you use any other USB cable, charging will only go as high as 10W. The provided case fits the Mate 10 perfectly and will keep the rear safe from scuffs, which are more likely as of late since Gorilla Glass prioritized shatter-proofing over scratch resistance. Some units (such as ours) may come with a factory-applied screen protector. We got rid of it for our photo shoots and screen tests but having both these protection options right out of the box is great. We would have appreciated a more premium case, that's for sure. The Huawei Mate 10 measures 150.5 x 77.8 x 8.2mm and that's astonishingly good 5mm shorter and 1mm narrower than the Mate 9, which had the same size screen. The Mate 10 weighs 186g, which makes it 4g lighter than the Mate 9 - the benefit of ditching the metal back. 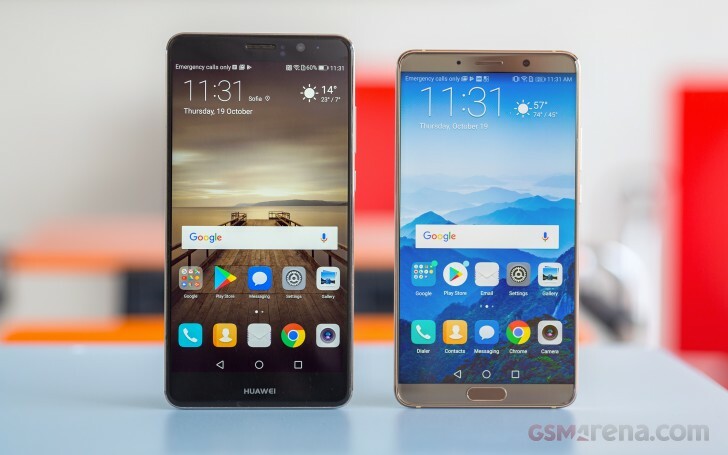 Putting the Mate 10 next to its predecessor is the easiest way to appreciate the trimmed bezels. And if you look closer, you'll see that both screens are actually of the same size. The first impression is important and the Huawei Mate 10 knows it. It's a fine looking handset, no two ways about it. A massive screen with near-zero bezels, a smart glass design and some attractive paintjobs all contribute to making the Mate 10 so appealing. After generations of metal-clad Mates, Huawei changed its mind and opted for glass instead. 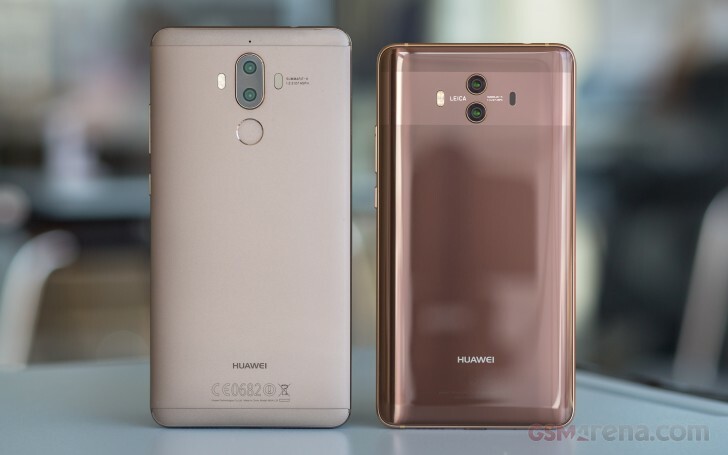 Unlike Apple though, Huawei didn't reuse an old design - it didn't even keep the old camera accents. Design-wise, everything about the Mate 10 is new and that has to count for something. So, the Mate 10 now comes in a dual-glass body, held together by a brushed metal frame. 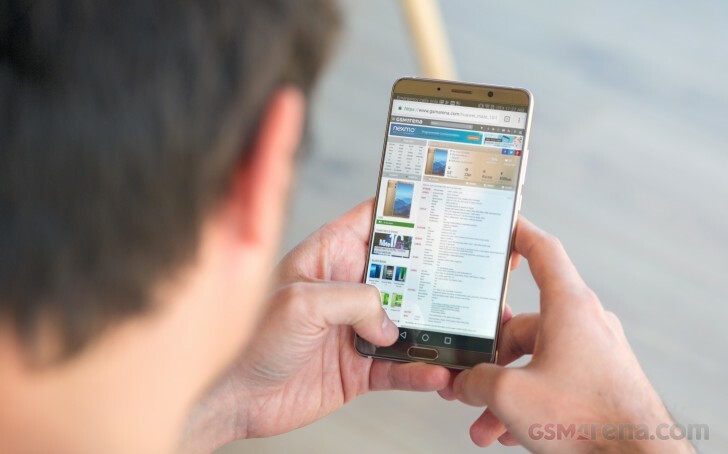 The screen bezels have all but disappeared and the fingerprint scanner has been moved over to the front, doing double-duty as a Home or a multi-function key, depending on your preferences. The good news is that the bottom bezel didn't grow to make room for the new tenant. Speaking of, the fingerprint reader is the fastest and most accurate unit we've used to date. It's always-on, of course, and feels almost like it recognizes your fingertip even before you touch the surface. Yup, it's that fast! The screen sits behind a Gorilla Glass ending on a subtle curve. The rear Gorilla Glass got all the premium treatment - it has a 4-axis curve meaning all sides are curved towards the frame. The effect is stunning to look at and quite practical too. 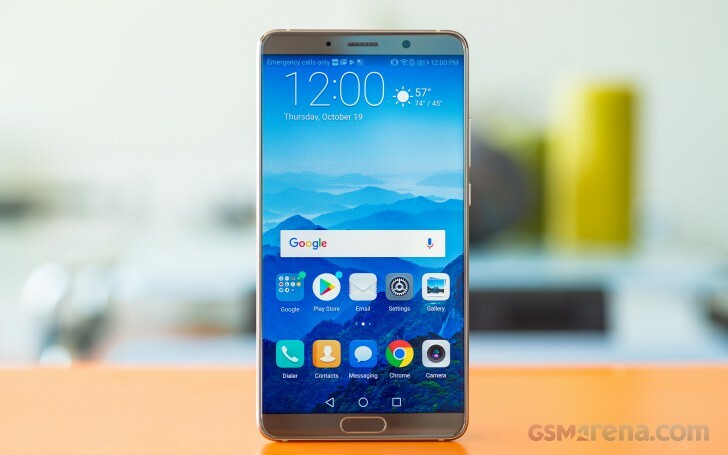 The dual-camera at the back may be keeping the old sensors, but it got enough upgrades for Huawei to highlight it on the Mate 10 with a wide strip of a darker hue, which makes the design easily recognizable. The RGB and monochrome cameras have slim metal frames, bulging just a tiny bit. But don't you worry, the Mate 10 doesn't wobble when resting on a flat surface, and you can barely tell the humps exist unless you run your finger over them. A lot of dust tends to gather around the lens rims but at least they're quite easy to clean. The Huawei Mate 10 feels very nice in the hand, and the metal frame provides for a splendid grip. For a near 6" phablet, the Mate 10 looks amazingly compact. Unfortunately, the water-proof body is a Mate 10 Pro exclusive - the regular Mate 10 is just dust and splash protected - IP53 in particular. Recent teardowns have revealed everything in the Mate 10 is in fact water-tight ave for the USB port. Above the 5.9" IPS LCD display is the earpiece, which also doubles as a second speaker. The selfie camera, a couple of sensors, and a small notification LED are nearby. Below the new screen is the relocated fingerprint sensor. The Home key can be re-programmed as a multifunctional key if you want to get rid of the standard Android onscreen navigation. If so, a tap will work as back, a tap-and-hold as Home. Left or right swipes will launch the task switcher. The card tray is alone on the left. It can take a nano-SIM card and a microSD card. 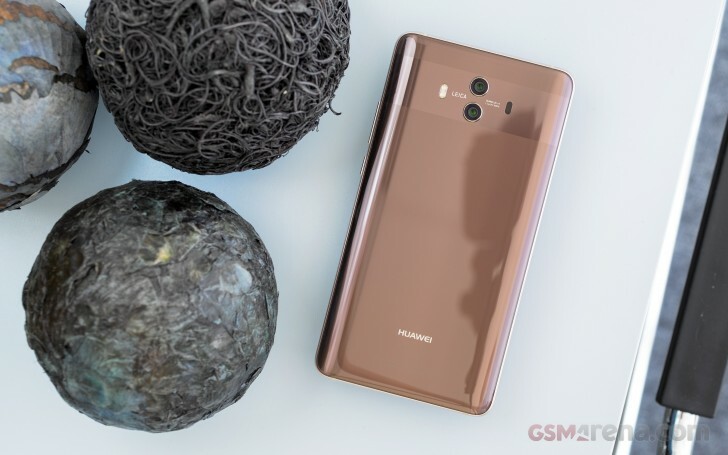 If you opt for a dual-SIM Mate 10, you will be able to swap the memory card for another nano-SIM. The volume rocker and the power/lock key are on the right. 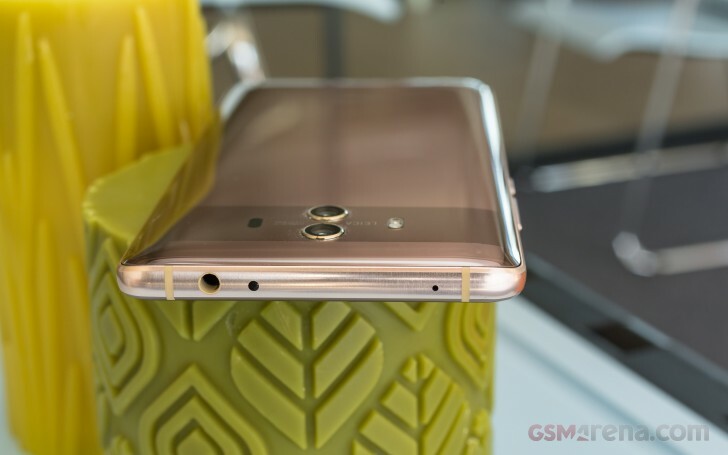 The Huawei Mate 10, unlike the Mate 10 Pro, has an audio jack, but it's safe to guess this is probably its last appearance on the Mate series. The 3.5mm port is at the top, alongside an IR blaster and the secondary microphone. The mouthpiece is at the bottom, next to the USB Type-C port. The second speaker is also around, behind a micro-drilled grille. The dual-camera setup behind the SUMMILUX-H lens is at the back, highlighted by the darker painted strip. There is a dual-LED flash around too. We already mentioned the slightly bulging lens rims and we don't think this is going to be an issue in daily use.